Do you know of any people group that has been forced out their land, scattered for thousands of years, lost their language, and in a matter of a few short years (less than 200) made their way back to their land, restored their language, and became a thriving democracy that has blessed the world through advancements in technology, medicine, and more? You must know that Israel and the Jewish people are the only ones! And who could have brought them back but God? In Ezekiel 36—37 God says that He would do just this and here we are, watching it happen! Danielle Mor, from Angels of Zion and The Jewish Agency for Israel joins us today. If you are a Jewish person and want to make aliyah or immigrate to Israel, you must go through The Jewish Agency for Israel. Danielle shares with Chris the way the agency helps those coming in. From language, job training, housing, and connection—The Jewish Agency is there every step of the way. You can help by donating to our aliyah fund. All proceeds go directly to The Jewish Agency for Israel and their work in bringing the Jewish people home. Steve Conover: In Ezekiel 38 we find God speaking to the people of Israel, saying, "I will take you from the nations and gather you from all the countries. Then I will bring you to your land." This is the Friends of Israel Today. I'm Steve Conover. Chris Katulka: And I'm Chris Katulka. The Bible is very clear about God's desire to resurrect Israel, restore and return the people of Israel, the Jewish people, back to the land. And friends, we live in such a unique time in human history. Jewish people, just as the prophets have promised, just as Steve read in Ezekiel 36, are returning to the land. And today on the program, Danielle Mor will be joining us. 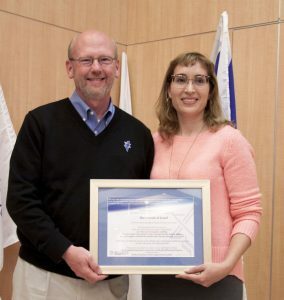 Danielle is director of Angels of Zion, an initiative to connect Christians from around the world to the work of the Jewish Agency for Israel and helping Jewish people return to the land God promised them. It's an exciting time and Danielle has some great things to tell us. Steve Conover: In the news, Israelis will go to the polls Tuesday, April 9, to vote for the political party they believe will push Israel forward. Prime Minister Netanyahu's Likud party and the blue and white party led by former IDF General Benny Gantz are neck and neck in the polls. Chris Katulka: This is interesting because Benjamin Netanyahu is the longest serving prime minister for the state of Israel. So there's a lot hanging in the balance here. And there's a lot of major events happening in Israel right now that can determine this election. First President Trump recently recognized Israel's sovereignty over the Golan Heights and this really, I think, helps Netanyahu's poll numbers increase. Yet Netanyahu, how he's going to handle this next potential war with Gaza between now and the election could have some profound effects on whether or not he remains prime minister. But I think this is important for all of us to understand. I know that there's probably a lot of Prime Minister Netanyahu fans out there listening right now, but I want to remind you, whoever wins, as Christians, we know with confidence that God is the one who is in control. The rebirth of the state of Israel wasn't simply this random desire the Jewish people had to return to the land in the 19th and 20th centuries. The Jewish desire to see the rebirth of the state of Israel is rooted in the Scriptures. It's been on the heart of the Jewish people to return to their ancestral homeland for thousands of years. Why? Because God promised it. Let's listen to what Ezekiel the prophet says in chapter 36 verse 24. He says, "I will take you from the nations," speaking to the Jewish people. "I will take you from the nations and gather you from all the countries. Then I will bring you to your land." God promised to return the Jewish people to the land of Israel. Now, Jewish people have always been present in Israel. They've had a continual presence there. But it wasn't until the late 1800s that Jewish people from all around the world started to make aliyah, and that is why I am excited to introduce you to our guest here in studio, Danielle Mor. She's the director of Angels of Zion. Glad to have you on the program. Thanks for being with us, Danielle. Danielle Mor: Thank you very much, Chris. Chris Katulka: Now, Danielle, I used the word aliyah. So can you explain to our listeners. Some of them might have gone, "Chris, what are you talking about? What is that word mean? What is aliyah?" Danielle Mor: So that's a good starting question. Aliyah is the Hebrew term for ascension, for going up. And it refers to, in a spiritual sense, when Jews used to make pilgrimage and go up to Jerusalem during the high holidays. And in recent years, it means, really the return of the Jews to the land of Israel. It's always meant that when Jews return to Israel, they go up spiritually, so they're not just immigrating. They are going up there, making an aliyah to Israel. Chris Katulka: So now that we understand what aliyah is, it's a spiritual connection to the land and going to the land, but also today in its modern sense carries the connotation of immigration. And so can you share with us a little bit about Angels of Zion and the Jewish Agency? Danielle Mor: Okay. So I work for the Jewish Agency for Israel. We are the organization that established the state of Israel in 1948. In fact, the reason for our creation back in 1929 was to be the vehicle that will bring the redemption of the Jewish people, that we will establish the land of Israel, build the land, its infrastructure, and build the people of Israel. And that has been our mission since 1929, focusing on aliyah and on building the land. In 1948 it was our leadership, led by David Ben-Gurion, who established the state of Israel, became the first government of Israel. But realizing that the state of Israel isn't a state like any other. It's not just responsible for its own borders and for its own citizens. It's actually responsible for all of the Jewish world. It's responsible for Jews everywhere. And it has a historical and faith role to fulfill. So the government made a special law, the law of the Jewish Agency, they made it back in 1951 and then reinstated it in 2017, and this law says that the Jewish Agency for Israel will be the organization working on behalf of the government of Israel and the people of Israel to connect with the global Jewish world, and with the Friends of Israel. So we're responsible for aliyah. Since 1948 we've brought home to Israel over three million Jews. Danielle Mor: It gets better than that. Three million Jews from over 100 countries, speaking about 40 different languages. We've built up the land, established over a thousand communities, the railway, the waterway, the electric company, the airline. Those were all established by the Jewish Agency. And today, when the state of Israel is stronger to stand on its own two feet, industrializing and et cetera, our role is really focused on aliyah and on connecting the Jews around the world to each other with Israel at the center. Now Angels of Zion, if you ask what that is, we are a small but very passionate unit within the Jewish Agency that's focused on making friendships and building bridges with our friends in the Christian world. Chris Katulka: Okay, and that's where you and I come together here. We're evangelical Christians that believe in what the Scriptures say about Israel and the Jewish people, that God values Israel and the Jewish people according to what the Scriptures say. And I feel like there's a common bond and understanding. There's a common passion that we have to make sure that we see the same thing happen, that Jewish people have a sense of value in the land, that they're connected to the land. And that really, for us, even as evangelical Christians, here at the Friends of Israel, is to let people know that God has a plan for Israel and the Jewish people and that this is a part of God's great plan that he has. Can you talk a little bit, you talked about the idea of Jewish people coming back from 40 different countries and three million Jewish people from all over the world. I think a lot of times in the American mind we can think, oh, they're all Jewish people. They're just coming back to the land. But this is millions of different people, different cultures, different languages. What is the assimilation process like for Jewish people when they return to their ancestral homeland? Danielle Mor: So on the one hand it's very similar to what you would think any immigrant experience is. You leave everything behind, you leave your home, your family, your language, your culture, and you come to a new home and you need to make it your home. That is obviously a very challenging and hard process. People talk a lot about immigration these days. And Israel, the unique thing about it is that each and every immigrant, each and every oleh, a person making aliyah, is considered a real blessing for the state of Israel. The state is encouraging through the Jewish Agency that Jewish people make that choice. Sometimes it's really a choice and sometimes it's like waking up from a nightmare because they're living in harsh situations and coming to Israel is really their salvation. So whether it's by choice or whether because it's a push, it is really a force that's pushing them to come to Israel, we are there to welcome them. Last year we gave homes in Israel for periods of six months up to two years to about 12,000 new olim, with complete Hebrew education, housing, helping them find jobs, getting their children settled into school. And our focus is really on those that are in need and the young people, the people that need a little bit of help, a little bit of guidance. They're coming alone without their parents, and we're there to help them in their first steps so that they can grow roots and blossom. Chris Katulka: I'm just imagining what it's like for a European or American Jewish person to make aliyah, and they land and is one of the greatest obstacles maybe the language? Danielle Mor: It really depends on their age. The younger they are, the easier it is. And what the state of Israel and the Jewish Agency do is they offer every oleh, every immigrant, free Hebrew studies. It's our famous 555, five months, five days a week, five hours a day. Chris Katulka: That's amazing. I love that. Danielle Mor: But I would say that the two toughest challenges have to do with employment and with feeling that you're at home, feeling that you're a part of a community. That's why a lot of our programs really help with, first of all, getting trained in a profession that's needed in Israel, and second of all, once you're living in a center with other olim like you, you become best friends for life and you go through this journey together. Chris Katulka: Folks, we are talking to Danielle Mor, and she's the director of Angels of Zion with the Jewish Agency in Israel, and we're having a great conversation about aliyah, Jewish immigration for Jewish people all around the world who desire to return to the state of Israel, to return to their ancestral homeland. And when we come back we're going to continue our discussion. I want to ask Danielle about the IDF, what role that plays in helping to assimilate people into the land, and also antisemitism around the world. So be sure to stick around, everyone. Steve Conover: We've been listening to Danielle Mor talk about her organization and how it helps Jewish people make aliyah. But they also help them integrate into Israeli life by providing language courses and job training. The Friends of Israel has partnered with the Jewish Agency for Israel so that you, our listeners, can help Jewish people escape persecution, move home to Israel, the land God gave them, and become integrated and thrive in their land. To donate, go to FOIradio.org. That's FOIradio.org. You can call our listener line at 888-343-6940. That's 888-343-6940. Or you can send a donation by mail to the Friends of Israel Today, P.O. Box 914, Bellmawr, New Jersey, 08099. Once again, to donate by mail, the Friends of Israel Today, P.O. Box 914, Bellmawr, New Jersey, 08099. Chris Katulka: Danielle, you were talking about Jewish immigration, assimilation for Jewish people from all around the world coming back to the land of Israel. And I'm wondering, it's a requirement for Israelis to serve in the army. How much does that play a role in the assimilation process for Jewish people who are looking to assimilate to the land of Israel? Danielle Mor: It plays a major role, because when people make aliyah to Israel, one of the best ways for them to feel that they are a contributing, real part of Israeli society is when they join the IDF. And in fact, it's not even a matter of choice. When people make aliyah and they're at the relevant age, in their late teens or early 20s, they will be joining the IDF. And as you can imagine, being a soldier is tough, and being a soldier that's new to the land, new to the language, and very often a person that came on his own at the age of 18 or 19 without their parents, without their family, and how to serve and defend and fight for your new country when you're on your own is very tough. So we do a lot of work to help the new olim prepare for the idea. We support them when they're in service and then we also help them as they transition to being civilians in Israeli society. Chris Katulka: I have a dear friend, brothers actually, from Switzerland. They immigrated to Israel. They served in the army, and I can remember coming back year after year and seeing almost as if overnight they assimilated right into the Israeli culture because of their time in the army. But you know, there are other factors around the world that are pushing people, Jewish people, to the state of Israel, and it's something that doesn't bring me any joy to talk about. And it's antisemitism. Danielle, antisemitism is on the rise in Europe, in Western Europe, in America even. Is this having any play in Jewish immigration to the land of Israel? Danielle Mor: So when the Jewish Agency established the state of Israel, it made a very clear promise of “never again”. Never again will there be a situation like what happened in the holocaust or years before that. The Jews are in danger and that they have nowhere to go. The state of Israel will always be open to any Jewish person who wants to make it their home. Now antisemitism, like you say, Chris, is always a negative thing. It's always bad. It's bad for the Jewish people and it's bad for the general community, for the general surroundings. Because it's hate and it's not what we want to be as people of faith. But what you see, one of the results of it is when Jewish people feel unsafe and unwelcome and that they can't raise their children in a safe environment, and they worry about sending them to school. Can you try to imagine what it's like for you? If you'd be afraid to go to church and pray because you'd be afraid that you'd be attacked just for being a Christian? So Jewish people around the world feel that in different places, and so the answer to them is, you can come home to Israel. Chris Katulka: I mean, really, if anything, that was the impetus for Theodor Hertzl to establish the state of Is ... or to set forth to establish a homeland for the Jewish people. He saw the antisemitism that was happening in France at that time and said, "We need a place to be." That's the reason Israel is so important right now, because as antisemitism, which we think after only 80 years or so since the holocaust, you'd think we would be done with this, and we're not. We're seeing it come back again. This time, though, the Jewish people have a place to go, a homeland to go to. I know that there's probably a lot of Christian listeners right now who are wondering, number one, how do I get involved in this? How can I help Angels of Zion? How can I participate? Can you share a little bit how our listener, our Christian audience can be in touch with you and with your program? Danielle Mor: So we welcome friendship from Christians around the world. It was Hertzl who coined the term Christian Zionists, because even back then he realized that there are Christians who love Israel and are supportive of the Jewish Zionist cause. And there are many ways. First of all and most important of all is to pray. To pray for the peace of Jerusalem, to be the watchmen on the walls, to pray and then to have all the benefits of what prayer ... we all know what prayer can bring. Beyond that, share the truth about Israel. There's so much hate around. There's so much lies around. Share the truth. Tell what your experience of Israel is. And beyond that, of course, you can visit us. And we're happy. Friends of Israel have visited with us a number of times, and when you visit you learn more and you know how to direct your prayer. And obviously you can also give financially. You can give and support the aliyah, the gathering of the exiles, the coming back home of the Jews, where they are supporting an individual on their entire journey, whether they are supporting part of that journey. We're talking about a few hundreds of dollars and up to thousands of dollars to help sponsor one person in their new life. And any amount is a blessing. And I would encourage people to go to our website to learn more. It's Jewishagency.org. You can learn about everything that we do. When you go to Jewishagency.org you can also click donate and designate your donation for aliyah. We also have a special website, the Angels of Zion, for our friends, and what does Angels of Zion actually mean? It means that when you, as a Christian person of faith, support the Jewish Agency, you are in fact becoming an angel of Zion. Chris Katulka: I like that. So it's Jewishagency.org. Chris Katulka: Folks, I want to encourage you to go to those websites. Make sure you see what Danielle and the Jewish Agency are doing. Danielle, thank you very much for taking the time to come share with our audience and with me about the value of aliyah, what it means. And folks, remember something. It's something that comes right from the Scriptures. Thank you so much, Danielle. Danielle Mor: Thank you, and if I can add one part that comes from the Scriptures, in Isaiah 49:22. It says very clearly that when God will bring his people back to Israel, it will be the people of the nations. It says, "Behold, I will lift my hands to the nations and set up my standard to the people, and they shall bring your sons in their arms and your daughters shall be carried on your shoulders." The people of the nations are you, the Christian people of faith that could work with us to bring our children back home. Chris Katulka: Amen. Thank you, Danielle. Danielle Mor: Thank you, Chris. Steve Conover: Now Apples of Gold, a dramatic reading from the life and ministry of holocaust survivor, Zvi Kalisher. Mike Kellogg: Deuteronomy 20:1 says, "Do not be afraid, for the Lord your God is with you." Yet in Israel we live in the light of this promise day by day as we face scud missile attacks from Iraq. We are sure of God's protection. Therefore we can sing confidently the words of our national anthem, Hatikvah. Even with missiles being dropped on us nightly, people continue their daily routines with high morale because they know God has said, "I have set watchmen on your walls, oh Jerusalem. They shall never hold the peace day or night." Although most of our people do not believe in messiah, they do trust in the promises of God to his chosen people. There are, however, many new immigrants in Israel, especially from the Soviet Union, who do not know the promises of God since they have lived all their lives under communism. As soon as they arrive, the ultra orthodox tried to convert them into their fold of Judaism. They tell the immigrants not to have any contact with Christians, but truth ultimately conquers. I consider it an obligation to comfort such people with the word of God, and I am thankful the Lord has enabled me to speak their language. When I first talk with a new immigrant, it's not with warnings, but with the spirit of friendship. And then we can be open with each other and I can share my faith. Initially the immigrants are surprised to find a Jewish person who believes in Christ, especially in Israel. One immigrant told me, "It is impossible for a Jew to praise the name of this one whom Jews have hated through the centuries." I replied, "I have heard many say this. You have been brainwashed against believers from the moment you stepped off the plane. But if you read the Jewish scripture for yourself, you will understand how to have true faith in God. I do not have with me any of the old commentary books, no stories, no traditions. But if you wanted, I will give you a Bible in the Russian language, and then you can make your own decision about God." Even though the immigrants have been instructed to stay away from believers, they are independent and want to make their own decisions in their new land. Of course, some are skeptical. Some have asked me if believers in the Lord are against the Jewish religion. I responded, "I'm not against any religion if it's in accordance with the Bible. But I am sorry to say that most of the people of Israel are far from being the holy people to the Lord your God that he has instructed them to be in Deuteronomy 7:6. I only want to help you find the Lord your Savior. Then you will truly be his chosen people." These immigrants were very moved by our conversation. They said they had learned more in one hour than they did during several days of instruction from their assigned guides. I pray the Lord alone will be their guide and lead them into his truth, which alone will make them free. Finally, during these difficult days, I pray for the peace of Jerusalem. May they prosper who love you. Steve Conover: Thanks for joining us today. Chris, I was thinking as you and Danielle were talking. There are Jewish people that want to make aliyah to flee persecution, of course, or other reasons, but from a biblical perspective, what is the significance of the Jewish people and their going back to the land? Chris Katulka: You know, for the past 11 weeks, earlier in the year we did a whole series called the Common Thread and we looked at the idea of this one promise that God made to Abraham, how it binds all the Bible together. And what's amazing to think about is the reason that God's going to call the Jewish people back to the land, the reason Ezekiel says that prophecy, I'm going to return you to the land, is because God is going to fulfill the promise that he made to Abraham. It's his name on the dotted line. That's what makes it eternal, that's what makes it run through the Bible, and that's why it's so important that God will one day, as he's working now and I believe working in the future, bringing Jewish people back to the land just as he promised. Steve Conover: Well said. Thank you, Chris. And I wanted to give you that contact information once again. To make a donation or to partner with the Jewish Agency, go to FOIradio.org or call our listener line at 888-343-6940. You can send a donation by mail to the Friends of Israel Today P.O. Box 914, Bellmawr, New Jersey, 08099. Thanks to Danielle Mor for being our guest today. Chris Katulka is our host and teacher. Today's program was produced by Tom Gallione, co-written by Sarah Fern. Apples of Gold was voiced by Mike Kellogg. Jeremy Strong composed our theme, and I'm Steve Conover, executive producer. The Friends of Israel Today is a production of The Friends of Israel Gospel Ministry. We are a worldwide Christian ministry communicating biblical truth about Israel and the Messiah while fostering solidarity with the Jewish people. The Jewish Agency for Israel helps Jewish people make aliyah and integrate into Israeli life by providing language courses and job training. The Friends of Israel has partnered with The Jewish Agency for Israel so that you, our listeners, can help Jewish people escape persecution, move home to Israel—the land God gave them, and become integrated and thrive in their land. GIVE TODAY!IN CANADA? GIVE TODAY! Even as the rockets are being launched into Israel at night, the Jewish people are off to work and school the next day because they know God is watching them. Although many are not believers of the Messiah, they believe God is their protection. As new people come into the country of Israel, Zvi talks with them as a new friend. Because of Zvi’s warm welcome, he is able to share about God’s love through His Son. Zvi’s story is available in Elwood McQuaid’s book, “Zvi: The Miraculous Story of Triumph over the Holocaust,” Order Here.